Hello friends and fellow Predator Flagship crewmates, welcome back to EDHREC and our continuing biweekly column, Non-Basically Speaking, the series that strives to identify non-basic lands that should be considered valuable staples or hidden gems based on their EDHREC visibility. Assuming that the average reader has successfully tuned their decks with regards to mana base, a healthy portion of this series focuses primarily on utility lands and their viability on a per-commander or theme basis. In not-so current events, 2016’s Oath of the Gatewatch introduced us to creatures and spells that could only be cast with colorless mana. Colorless mana was given a refurbished identity and nowadays it is also commonly referred to as diamond mana. A healthy portion of the EDH community was abuzz with various ways to incorporate Magic’s newest fad and took to their deck building rituals with Kozilek, the Great Distortion and a handful of other colorless commanders in mind. However, there was one commander in particular that has an amazing synergy with a few of these new cards and their diamond mana abilities, Vhati il-Dal. Unfortunately, as witnessed by the measly 60 Commander decklists flowing through EDHREC’s algorithms, Vhati il-Dal went virtually unnoticed as a deck that could handle adding colorless to its Golgari banner. What is it that makes Vhati il-Dal a superb candidate to include diamond mana reliant spells and creatures? While there are a handful of possible colorless-dependent inclusions we could run there are two cards in particular that provide a copious amount of synergy with Vhati’s ability to deflate a creature’s power or toughness: Endbringer and Warping Wail. Endbringer hosts a plethora of effects that beg to bask in the glow of the 60 watt bulbs that light our kitchen tables. In my humblest of opinions, it has been held back by the heavy demand of colorless-specific, diamond mana needed to fuel its abilities. Our Eldrazi Army Knife untaps every turn, can draw us cards and has a nifty method of tilting the tides of combat, but its “ping” ability for 1 point of damage that begs for a side-by-side creature control build with Vhati. Warping Wail also has a glowing gob of options that earns it the right to be called a colorless charm. The alluring appeal of Warping Wail is the unsuspecting counterspell, or, when combined with Vhati’s ability, an efficient way to exile practically any creature on the board. In today’s gaggle of thoughts we gawk at lands that accommodate the theory of splashing colorless spells into our two-color deck as well as our obligatory review of mainstream non-basic lands and hidden gems for our Golgari commander, Vhati il-Dal! Today’s article features the rare occasion where we delve into a discussion about mana bases. To include diamond mana spells we need to unearth dual lands that are efficient at producing colorless mana in addition to colors of our Commander’s identity. Of course we can run artifacts such as Thran Dynamo and our colorless basic land Wastes to produce colorless mana, but we can optimize our land base by including some of the following selections. It’s a bit mind-boggling to believe that there are better dual land options than Command Tower when splashing colorless into our black, green deck. Command Tower produces mana of any of our commander’s color identity, but since colorless is not a color, the Tower doesn’t produce diamond mana when we need it. A careful analysis of the lands on Vhati il-Dal’s EDHREC page reveal Tainted Wood, Twilight Mire, and Llanowar Wastes as dual lands that enter the battlefield untapped and are capable of producing any type of mana we need. In addition to these makeshift tri-lands, Reflecting Pool is another strong option capable of producing the fuel we need to run our colorless abilities and spells. “Colorless” does not have a color, but it is still a “type” of mana therefore diamond mana can be churned out by the Reflecting Pool. Mana fixing becomes an integral part of our game plan since we need to ensure we have proportionate access to black, green, and colorless mana throughout the game. While Verdant Catacombs is a top-notch play that can snag an Overgrown Tomb from our library, we still need to incorporate additional fetch lands to level our resources. Not only that, but if we need access to diamond mana, Verdant Catacombs won’t help us. The great part about mana fixing our colorless Golgari deck is we can rely on a slew of budget friendly options that can seek out our basic lands. We are definitely no strangers to Evolving Wilds and its functional twin Terramorphic Expanse. Both of these mass-printed commons can search out a Swamp, Forest or Wastes from our deck and put it onto the battlefield tapped. However, I have a bit more admiration for lands that enter the battlefield untapped so we can immediately utilize their mana. Blighted Woodland, Warped Landscape and Terminal Moraine are all top choices for our Colorless Golgari deck. They can produce a colorless mana the turn we drop them into play or we can crack them later to search for basic lands to stabilize our mana base. Now that our mana base is running at extreme efficiency, let’s take a look at a few utility lands that radiate an ample amount of synergy with our commander, Vhati il-Dal! Vhati thrives on destroying creatures and creating advantages and disadvantages in combat. Unfortunately, some of our opponents may decide that their battlefield needs to be protected with hexproof or shroud. Since Vhati’s ability must “target” a creature, cards like Lightning Greaves or Asceticism not only frustrate our commander, but also gum up our hand with unusable spot removal. Arcane Lighthouse (30% of 37 decks) is essential in our strategy to use weapons like Vhati and Endbringer to gun down opposing creatures. Being able to use the Lighthouse to remove hexproof or shroud go hand-in-hand with our desire to patrol the board. Another frustrating event throughout the course of the game is opponents that utilize recursion to get their creatures from the graveyard back to their hand or onto the battlefield. Vhati puts all this time and energy into destroying creatures and what better way to permanently erase the dead souls from the game than to exile them with a well-timed Bojuka Bog (47% of 60 decks)? Graveyard hate is a crucial part of our commander’s game plan and Bojuka Bog provides a safe piece of redundancy in a Vhati EDH deck alongside other methods such as Kalitas, Traitor of Ghet. If you are looking at a list of the worst non-basic lands in the history of Magic the Gathering™ there is a good chance that Desert (13% of 60 decks) will be on that list. In 99% of EDH decks Desert is a dreadful choice to include. In conjunction with Vhati’s ability to reduce a creatures toughness to 1, Desert’s ping ability will send a creature to the graveyard after combat has been resolved. An honorable mention that has analogous functionality is Quicksand. When used in tandem with our Commander’s ability we can sacrifice Quicksand to engulf the most intimidating ground-pounder looking to smash a player in the face. Desert and Quicksand will continue to perform above expectations if Horobi, Death’s Wail (38% of 60 Decks) is on the battlefield. While I previously mentioned most of our high synergy non-basic lands, there are still a handful of hidden gems not represented on EDHREC that provide a smidgen more efficiency to our colorless Vhati deck. Sea Gate Wreckage does not see a lot of play in Commander outside of colorless decks; however, it definitely has a home here with Vhati. 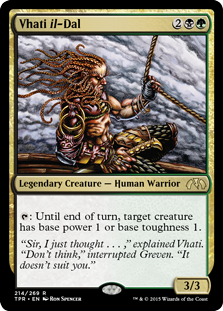 While we should have several other ways of drawing cards, in a real grindy game of EDH we may find ourselves reliant on a Sea Gate Wreckage for a few extra spurts of gas. Our deck’s composition should allow us to pay the diamond mana in Sea Gate’s ability cost without trouble. Most of the non-basic lands I mentioned thus far provide an additional layer of efficiency by entering the battlefield untapped. As a reward to ourselves for this level of resourcefulness I feel safe including Fertile Thicket as a supplementary green mana source. When Fertile Thicket enters the battlefield we sift through the top five cards of our library and have the option of putting a basic land on top. The rest of the cards are escorted to the bottom of our library. By using the Thicket’s ability we can continue to mana fix and keep a Forest, Swamp or Wastes on top of our library as our situation dictates. That should wrap it up for this week. We have successfully splashed “colorless” into our Golgari deck so Vhati il-Dal can bring out the full potential of Endbringer and Warping Wail. To round out more choices for the deck, our colorless options in Vhati also welcome other diamond mana reliant cards such as Sea Gate Wreckage, Spatial Contortion, World Breaker and Kozilek, the Great Distortion. What do you think? Did you enjoy the change of pace in this week’s column? Are there any recommendations for Vhati il-Dal? Are there any other Commanders that could benefit from “splashing” colorless into their color scheme? Let’s discuss in the comments below! Nick (Wally D.) is an avid fan of EDHREC, cool Commander brews and cold frosty brews! He likes to build Commander decks that include EDHREC favorites alongside his eccentric, oddball choices. In addition to EDHREC, Nick also writes casual EDH articles on MTGCasualPlay.com.